Yowza! This beautiful chronograph (stopwatch) is from the Swiss Legend Eograph Collection. It's dressy enough for wearing with a suit, yet totally practical for everyday wear. Tough and stylish stainless steel bezel, case and bracelet are durable. 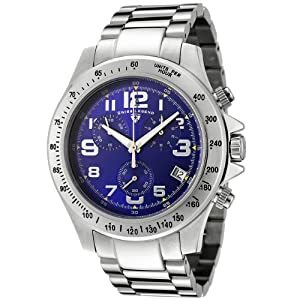 The blue dial has high contrast with the silver toned hands and hour markers. The subdials don't seem to get in the way of reading time at a glance because they are more subtle. The reliable Swiss quartz movement means that if he's late for something it isn't the watch's fault! If you're looking for a sweet watch at a reasonable price, this could be it.